Home brewing, to us, is one of our favorite pass times. Creating beers of your favorite style, experimenting with wild yeasts and bacteria, building your own brewing system using some good old ingenuity and creativity are what makes it great. 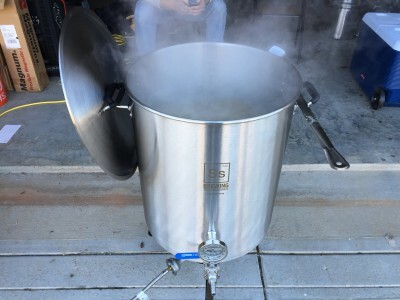 Over the past few years here at CraftBeerTraders we have been brewing on a traditional All Grain gravity system with a 10 gallon cooler mash tun and a 7 gallon boil kettle. After long brew days and small batches we decided its time to upgrade to a 20 gallon single tier system. But which kettle manufacturer should we go with? 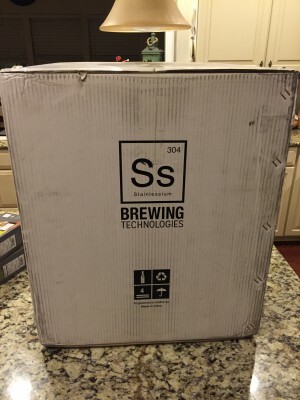 After a few months of research we decided to go with SS Brewing Technologies. So what made us choose Ss Brewing Technologies? Well actually a lot. First thing first these kettles are a thing of beauty with the Ss Brew Tech logo etched right on the front (its a pretty sweet logo too!). But on to what really matters, the specs. Their kettles are designed at the optimal 1.2 : 1 height to width ratio and made from 18 gauge 304 Stainless Steel with a triclad bottom to prevent scorching. This is ideal because it allows these kettles to be used with natural gas, propane, electric as well as induction heating. Additional features include; pre-drilled holes and weldless fittings for the included 3pc Ss 1/2″ ball valve and optional thermometer, riveted handles wrapped in silicone (a nice feature to not burn your hands), internal etched volume markings (hooray for no more sight glass cleaning!) and their new pickup tube / trub dam. 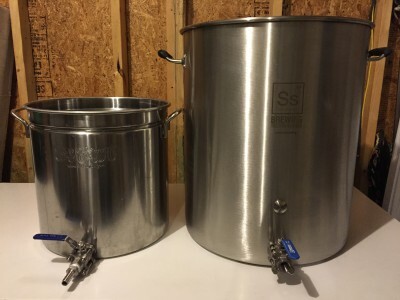 With size options of 10 gallons, 15 gallons and 20 gallons (30 gallon option coming soon), they cover all scenarios for building your own brewing system. Oh did I mention free shipping? A few days later our 20 gallon kettle arrives! Packaged in double wall corrugated cardboard we were overly excited to open up this behemoth of a box. Once the top flaps were opened, the belly of the enormous lid shimmers in your face. When we picked it up out of the box we both said out loud “holy sh**” in regards to the size and weight. This thing meant business! We also got our first experience with the silicone wrapped handle. You would think its not that big of a deal, well let me tell you that was a luxury I will never do with out again. A nice thick layer of silicone around the entire handle was extremely comfortable and provided a nice slip free grip. 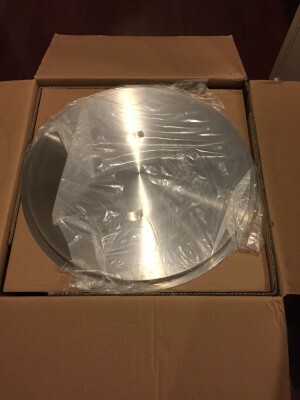 With the lid removed we got the first glance at the size of kettle. Needless to say we were smiling from ear to ear. Pulling the kettle out with both hands it hit light for the first time. Speechless. We unpacked the rest of the box which contained the accessories and just stared for a second at its beauty. 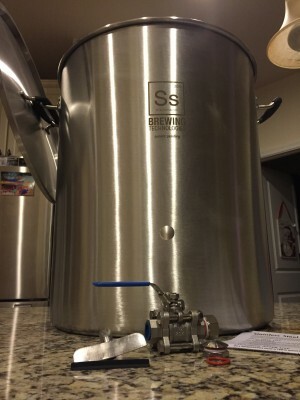 The 20 gallon kettle stood a little over 21″ tall and just under 18″ wide with 2 pre-drilled holes under the etched Ss Brewing logo. I cant tell you how happy I was that these holes came pre-drilled. 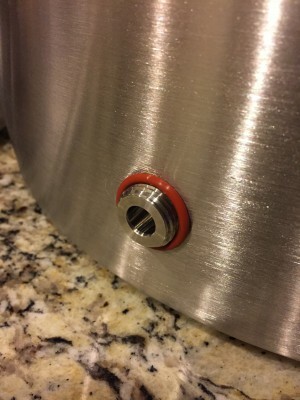 The last thing I wanted to do was drill holes into a brand new $300+ kettle. The handles are beefy, silicone wrapped and attached with rivets. 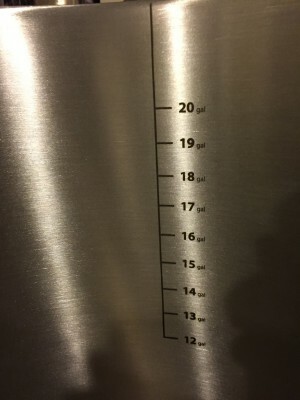 On the inside was the neatly etched volume markings from 12-20 gallons in 1 gallon increments. 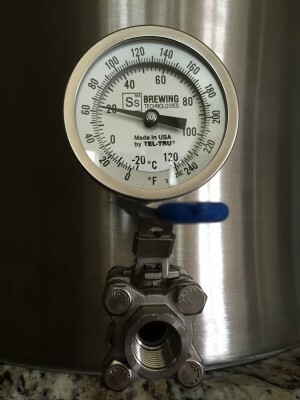 One of the reasons we chose Ss Brew Tech over others was that their 20 gallon kettle holds 22.7 gallons, a whopping 2.7 gallons of head space to aid in preventing boil over. One of the coolest side features, the lid can hang from the handles! 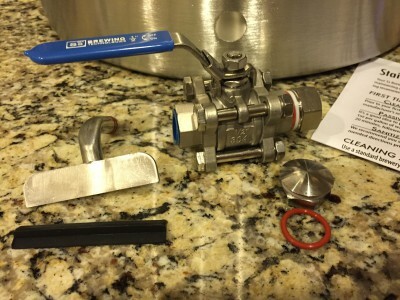 The accessories provided with the kettle was a 304 Ss 1/2″ 3 piece ball valve, Ss Brew Techs pick-up tube / trub dam, a coupling for the ball valve / trub dam, a coupling to plug the top hole if you are not using a thermometer as well as some additional gaskets. 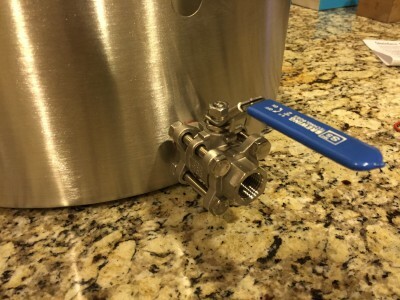 The ball valve is a traditional 3pc ball valve with Ss Brew Tech on the handle. The pick-up tube / trub dam is a pretty cool design. 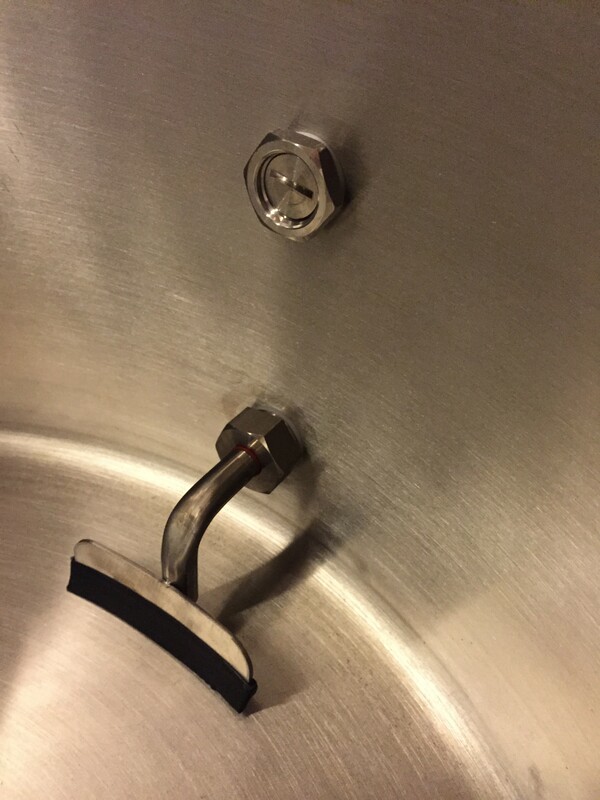 Its a 90 degree bent pickup tube with a curved 4″ piece of stainless welded to the front of it with a rubber blade that sits on the bottom of the curved piece to make contact with the bottom of the kettle. The tube itself has 2 o-rings around it and is pressed into the custom coupling Ss Brew Tech provides to form a nice tight seal. 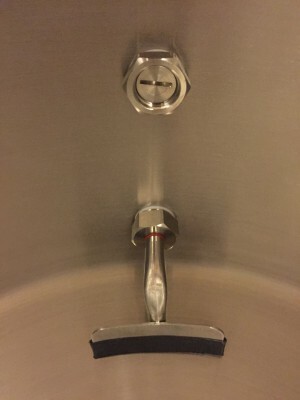 The concept behind the design is that after you whirlpool and the trub is in the center of the kettle, during draining the dam will block trub from being sucked up from the pick up tube. Its a clever little design and even better that its included with the kettle! Full installation guide can be found here. We opted to include a thermometer and weldless coupling. 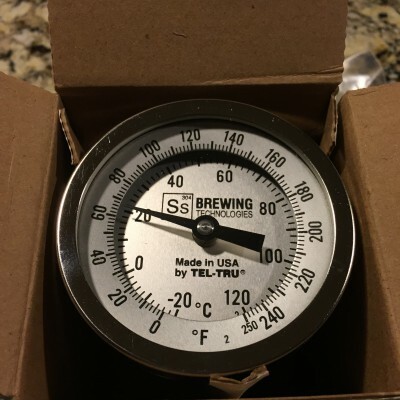 The thermometer is manufactured by Tel-Tru USA for Ss Brew Tech and includes a 3″ face with both F and C (on a cool 2 level face I might add) as well as a 2.5″ stem so to not interfere with submersion chillers. It has a 1/2″ male thread and is accurate to within 1%(full span). 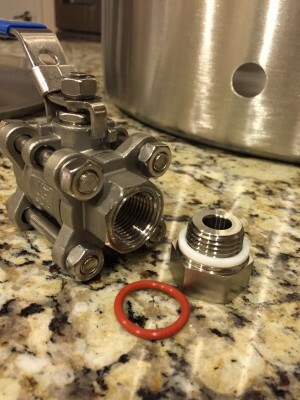 The weldless coupling is a sleek design with a 1/2″ female thread and hi-temp silicone o-rings. Full installation guide can be found here. 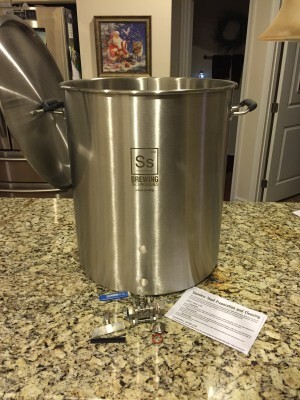 Overall first impressions of Ss Brewing Technologies Kettles, world class. These kettles met every want we had with additional features on top of that. But you cant just stop a review there with an unboxing, it needs to be tested! And thats exactly what we did next. To christen the kettle we decided that it was most proper to brew our experimental lambic base while sipping on some Cantillon Kriek 100% Lambic Bio. You can see in the picture our setup was a basic home brew setup, 10 gallon igloo mash tun and a Bayou classic high pressure propane burner. 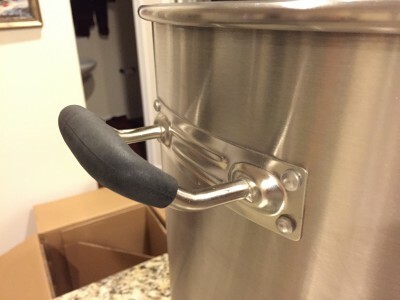 We wanted to test the kettle on a common home brew setup so that everyone can relate. The kettle fit great on the top of the burner. It had some over hang but was sturdy and safe. We brewed a 12 gallon batch of our lambic base so we heated about 17 gallons of water for our mash and sparge to produce a 14.5gallon boil. Watching the Ss Brew Tech thermometer as the wort began to rise we compared the readings to a digital thermometer we had. Readings were spot on. After a short while we had a boil and added our 60 minute hop addition. This was heaven. 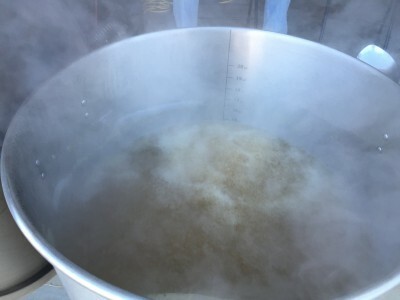 The boil was clean and controlled and with the large amount of head space we had no concerns of boil over. We set the timer and sat back sipping on our Cantillon. With 15 minutes left we put in our submersion chiller to sterilize and waited for the timer. Timer went off, we turned on the water and the cooling process began. This next part shocked us. We sat their and watched the thermometer needle drop continuously and consistently. Within 10-15 minutes we had 12.5 gallons of wort chilled to 75 degrees. Now I cannot say that this is a result of the kettle, but I will say Ive never cooled wort that fast even at 5 gallons in my other kettle. We picked up the kettle and its 12.5 gallons (.5 gallons more then expected) and placed it on a higher table for a gravity run into our fermenter. The handles were solid and sturdy as it took both of us to lift it. We opened up the valve and watched our lambic base enter the fermenter. The pickup tub / trub dam worked as expected, although we really didnt get to test what its truly designed for. We didnt hook up the pump to whirlpool and we only had 1.4oz of hops in a 12 gallon batch so there was minimal trub. I will say though that the flow rate was excellent. We were a little nervous seeing the 90 deg bend that the flow rate would be slower but once we opened the ball valve those nerves were gone. We will have to do another brew day with an IPA using the pump and whirlpool to really give the pickup / trub dam a vetted test but first impressions were extremely positive. 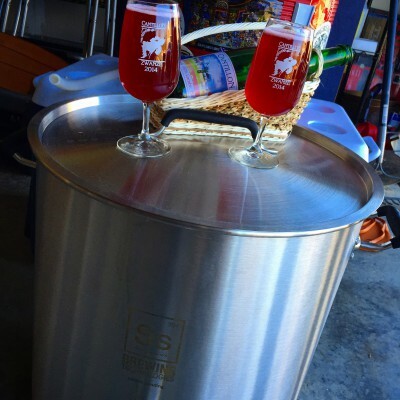 Our overall impression of Ss Brewing Technologies is that these guys are world class. From the quality of the kettle to the little details its everything we wanted and more. Beyond just the kettle Ss Brewing Technologies offers a lot of other quality home brew equipment like a Stainless Steel Brew Bucked with a conical bottom and Stainless Steel Conical Fermenters. 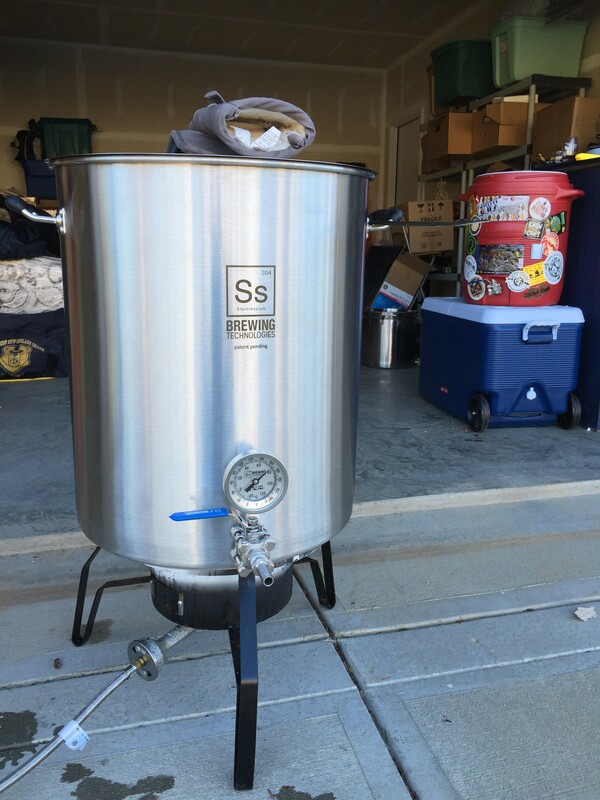 Ss Brewing Technologies has overly impressed us and you will see more of their products involved in our home brew setup. 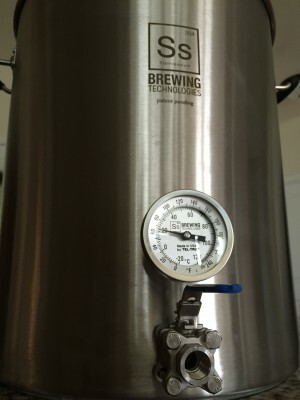 Check out more about Ss Brew Tech on their website www.ssbrewtech.com/.